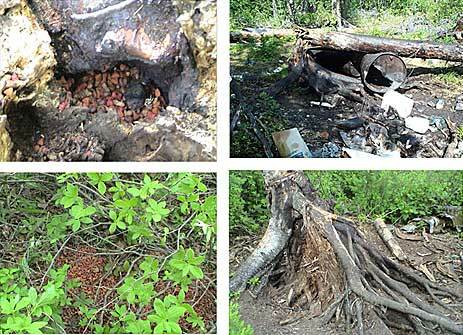 Locating a bear baiting site can take some work, so plan on scouting areas early. It is also advisable to have extra options in case you find other hunters or baiting sites close to your chosen area. Look for natural travel corridors or valleys where bears access water. Be alert to ridge lines or descending hills that lead to water. Bears will be more comfortable coming in to a site located in dense cover. Fairly thick brush, alders, or trees add a sense of security for bears. Knowing where not to set up a bait station is also important: We will cover legally restricted areas under the "Bear Baiting Rules and Regulations" section. In the meantime, a basic rule of thumb is to avoid open areas such as large fields, sandbars or beaches. Also consider hiking/biking trails and popular fishing holes to be "off limits." You can avoid conflicts and have a more successful hunt by being considerate not only of other bear baiters but also other members of the public that might frequent an area during or after the baiting season. After you have selected an appropriate location and registered your bait station, you can plan your baiting and site clean-up strategy. The best approach is to put your bait in a metal container and chain it to a tree. This will help minimize cleanup problems later (see below). A 30-55 gallon drum is a great bait container and, as discussed elsewhere, a metal drum can also serve as an accurate measuring device for judging a bear’s size. Be advised that whatever you haul in must also be hauled out: A 55-gallon barrel with bait that has not been hit will be extremely heavy. Never use plastic containers because bears chew them up and carry them off, leaving trash strewn about the area which you must then clean up. It works well to have two lids for your container. Start your baiting out with a lid with a large hole cut in it or no lid at all. Once bears have begun to sample the bait you can switch to a lid with one or more small holes cut in it. According to some experts, smaller holes are better. This is because a bear will linger longer if it cannot fill its stomach quickly or grab a mouthful of bait and run into the woods. Another reason to use very small holes is to prevent accidentally killing smaller bears; they’ve been known to get their head stuck in a bait container and die. Once the container is positioned, build a "crib" of logs around the bait. This will help position the bear for the best shot into the vitals of the animal. What types of bait should you use at your bait station? Only biodegradable materials may be used for bait. The only parts of fish or wildlife which can legally be used as bait are heads, bones, guts, skin, and the skinned carcasses of furbearers and fur animals. In GMUs 7 and 15, fish or fish parts are not allowed to be used as bait. This is because brown bears are often attracted to fish and other decaying meats. In some parts of the state, baiters are strongly advised against using rotten items such as chicken or turkey carcasses because these items are so effective at drawing unwanted attention from brown bears. You don’t want brown bears at your bait site: You’ll need to refill the barrel more often, they’ll chase black bears away, and they can be dangerous to you and others using the site. Even if meat or fish are legal baits in your chosen GMU, they are not necessary for attracting black bears. There are two main bait classifications, call bait and food bait. Call Bait: This is usually a strong scent used to draw bears in from long distances. It is most effective when you can get the call bait up high in a tree. Examples of call baits include sweet items coated in syrup or vanilla. A number of effective commercial scent lures are also available. Food Bait: Every veteran bear baiter has their own secret food bait, but the bottom line is to find something that keeps the black bears coming back. Examples of food bait to put in your drum container are: dog food, syrup, honey, molasses, doughnuts, old bread, popcorn or any mixture of the above items—but mainly sweet stuff. Using grease as either a call or food bait has significant drawbacks. Like other meat or meat-related products, it tends to draw brown bears. It can also make your task of post-season site cleanup extremely difficult. By law, you have to clean up your baiting site on or before the last day of the baiting season. This means packing out all food items (baits, scents), containers, and even soil or wood soaked with grease or contaminated with other baits. Soil and wood that contains residue of grease or other food items will continue to attract bears illegally after the season is closed. Avoid unnecessary disruption of natural vegetation at your bait site. Use a site responsibly and leave it in as good or better shape than you found it. Irresponsible behavior (e.g, leaving eyesores or post-season attractants) can result in bad publicity for hunters and possible restrictions against bear baiting. It can also result in you being ticketed. The following pictures show examples of poor site clean-up.